I don't particularly like red red wines from the south west of France, whether its the best and most expensive bordeaux, a heavy bodied Madiran or a rustic Cahors. 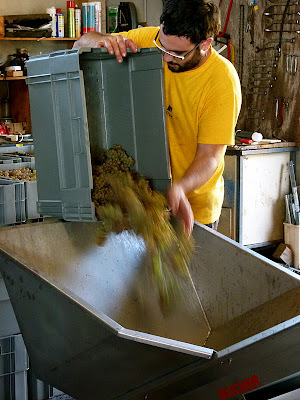 Last weekend was grape harvest time, and we went to help out but arrived late when the sun was already high in the sky and too hot for my celtic skin so we just took photos, watched, ate and drank – all those things that we are very good at ! Irouleguy is one of the smallest wine growing areas in France or maybe even in Europe. I think that there are not more than 10 growers or thats how many I can count on my 10 fingers. 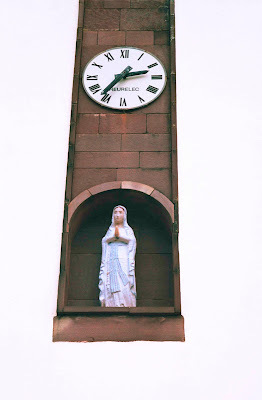 The centre of the wine région is the little village of Irouleguy which is basically a Church, a cemetary, a chistera wall and a town hall. 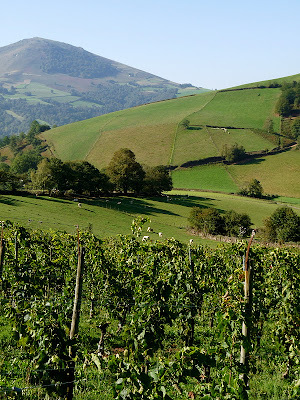 The surrounding countryside is a mixture of rolling hills and green dales, stretching as far as the eye can see, laden with ripened vines, their ochre leaves, grazing cows and sheep. 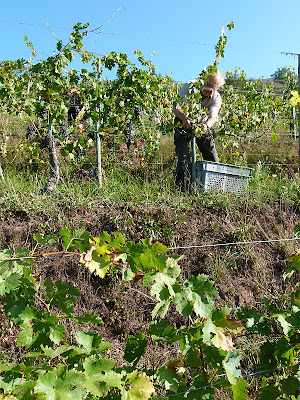 Michel and Therese settled in the village together in 1989 and began by renting 2 hectares from the local community, going organic, then biodynamic and building up their vineyard to the 8 hectares of tannat grapes, cabernet sauvignon, petit courbut, gros et petit manseng that they run today and are now helped with by four fine young men, two of whom are their sons. 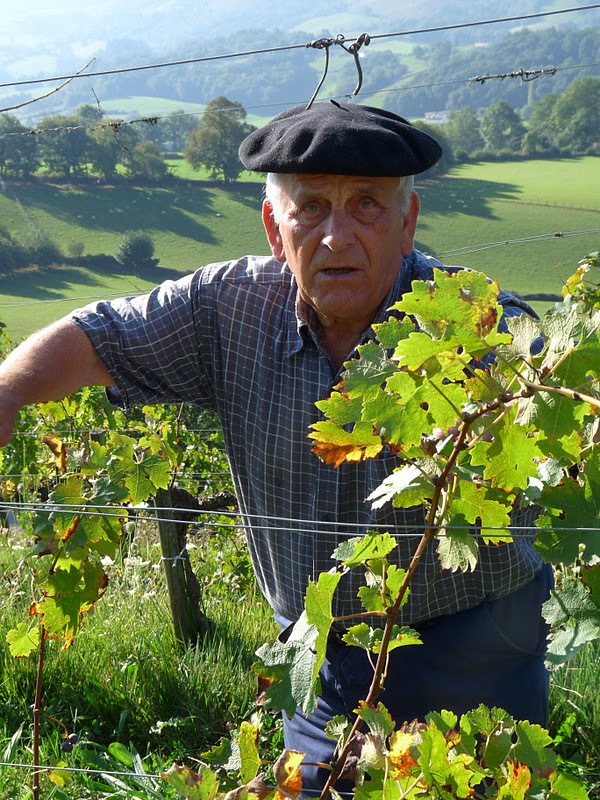 Michel was born in Irouleguy to a family of 5 boys but after his father died at the age of 13, he was sent to live with his grandfather where he slept above the stable among the animal smells and worked among the vines. Later he travelled afar to africa and south america but returned to the village once he had met his lovely and alsacienne Therese. 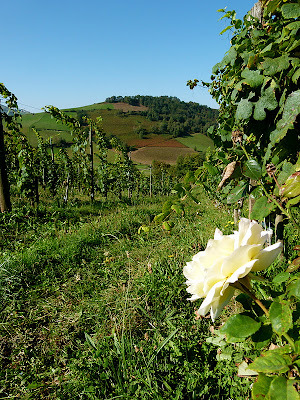 Instead of soaking their fields with Monsantos famous ROUNDUP, the Riouspeyrous family treasure the wild flowers that grow on their hillsides and understand the benefits they provide to the health of their plants and the distinctive taste they give to the wine itself. 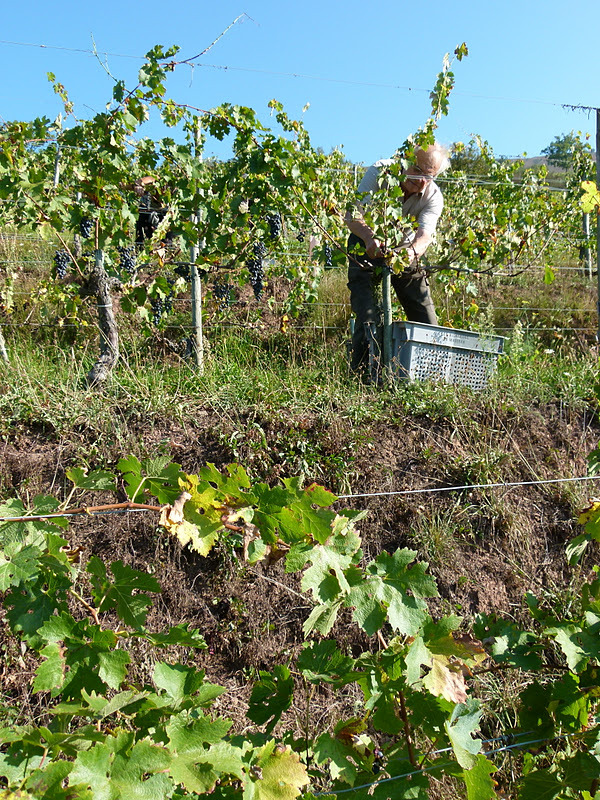 A local farmer, parks his sheep in the vineyards once the harvest is finished which keeps the unwelcome weeds at bay and nourishs the soil. 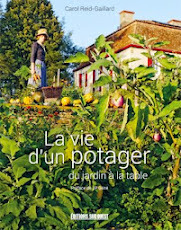 Clover, is their other natural fertiliser, while the dandelions mobilise iron and oligo éléments in the soil, and along with the dock plants loosen the earth with their long and winding roots and avoid the need for digging. The feet of the vines would be a shame to any grand cuvée in Bordeaux or Napa. Wild dill, St Johns Wort and clover flower decorate these steep hills in all seasons. The climate here is soft as they say in France ; it snows rarely, theres plenty of rain and the vines profit from the effects of the dry, southern wind called the Foehn which brings a distinctive taste to the grappes in the final part of the season. The problem with paradise is that it is temporary so a good hailstorm is also frequent on these hills. And the wine itself is so good. The red is a blood red-black, tasting of blackberry and currants. The white smells anise with a taste of lemon and wild flowers…..
Sunday started early for everyone else and by the time we arrived, Alain was bleeding from his arm and bruised on his hand from stray branches while the rest of the small team were crying out for coffee break. 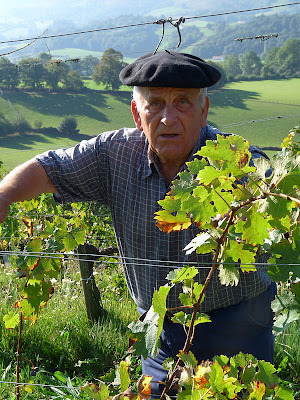 Manex, Michel's uncle smiled and laughed as Jean Francois tried to photograph him upside-down and I just relished the taste of the grapes almost candied in the sunshine. Further down in the valleys the cows munched on grasses while sheep baahed and meyed and echoed over the hills. 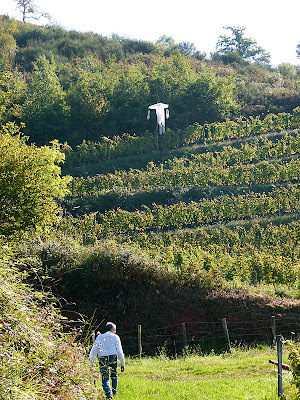 By 11am the harvest was finished and the grapes carried down to the chai where Michel, Therese and sons awaited. 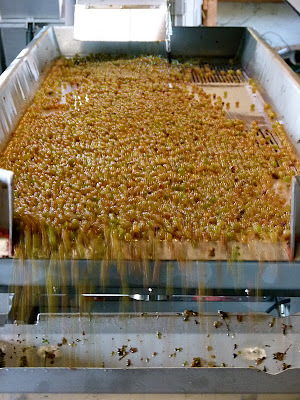 Both white (petit manseng) and red (cabernet sauvignon) were waiting to be pressed which must have been causing a lot of panic as they both needed to pass through the same machines without tainting the other. The whites went first as their crushing time is shorter.... the grapes first of all shorn of their woody stem and gently battered to loosen the juice and stones while we save a ladybird or cricket from going through the next violent process. Merci - cette famille est la plus gentille! 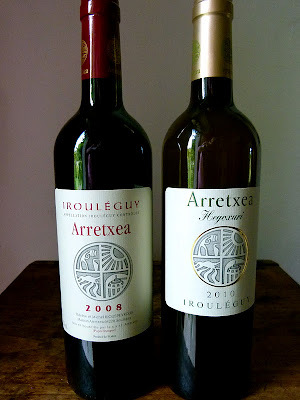 I would just like to add that Irouléguy is a tiny appellation in the Basque country. 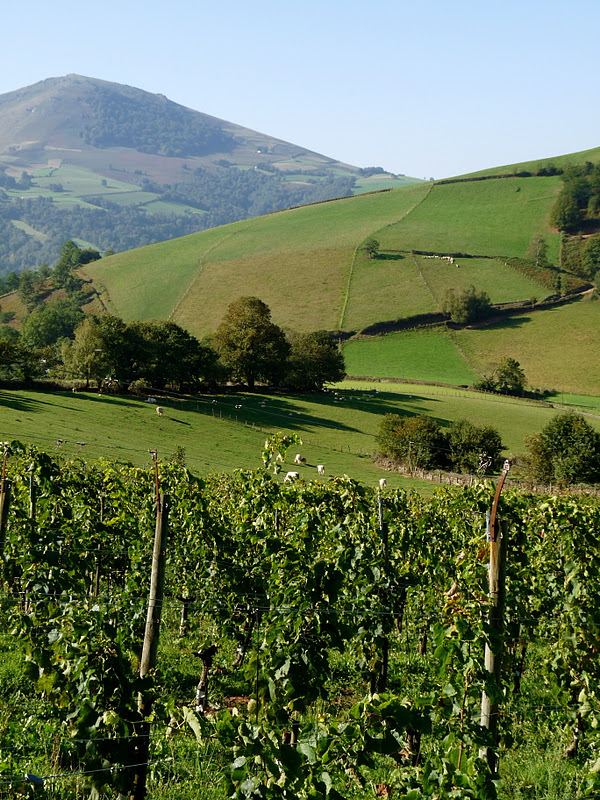 The vines are cut into steep Pyrenean mountains up to 400m above sea level, but being protected against the north wind, enjoy more sunshine than those from most French wine regions. We bring you mountain fresh white Irouléguy from the heart of the Basque country for collectors of arcana. These wines, made from Gros and Petit Manseng and Courbu, are electrifying, tense with acidity, displaying a fine citrus character, with wild flowers, gunflint and crystallised lemons, the taste equivalent of letting your tongue roller-skate down a glacier.